My latest art quilt has been made in response to the Cranwell Contemporary Group challenge titled Escape. When the theme was announced my first thought was of “escaping” to the Scottish Highlands……this area has to be my absolute favourite away from it all destination in the UK. I worked from memory, rather than looking back at photographs, as I wanted this piece to suggest a mood and a feeling of being in this area and not a specific, identifiable place. 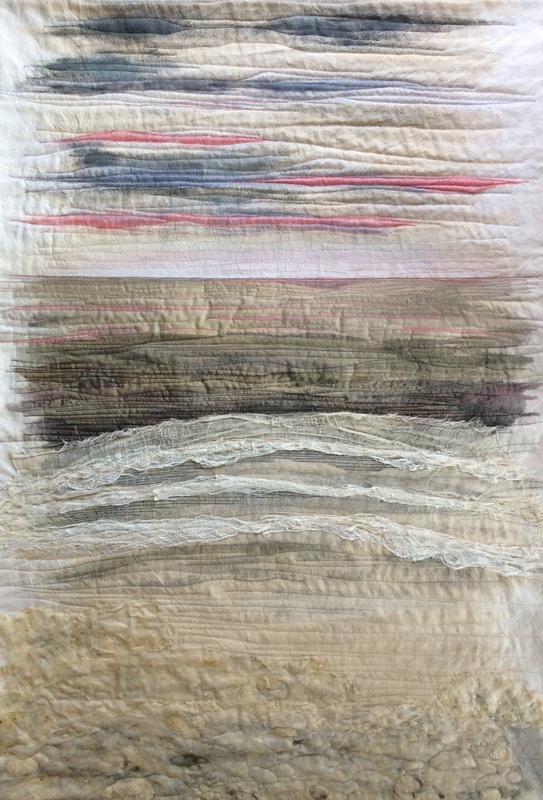 The colours are very neutral and muted, built up using Inktense paint, layered fabrics, Mulberry bark and silk cocoon strippings to create a textural surface. The finished quilt is 28” wide x 40” high. ← The Final Show and Tell…..
What wonderful textures and muted colors you have achieved. Beautiful! Thanks Ruth. I’m tempted to add a bit more texture yet, particularly on the pebble beach. You’ve certainly captured the essence – beautiful! Wide open peaceful calming – you delicately captured your Scottish escape perfectly. I love the use of the Inktense. Your post is a coincidence because I have just driven up into Scotland this very evening for a break! So I can really ‘feel’ your piece. Now that is a coincidence! Hope you have a lovely time Antje. So evocative of the Highlands – love it! Thanks Alex, I’ve got an idea for a similar scene using Lutradur…..just need to find a few more hours in the day so I can get it started! This is just beautiful. Such an amazing idea and stunning representation. Thank you Julia, I’ve really enjoyed working on this piece. Karen, this quilt is exquisite, I would like to walk through this texture and “escape”. Thanks Sharon, in that case it’s done it’s job!